Hai there guys im FoxKai. Im new to inkbunny and stuff so if i do things wrong please dont be to harsh at me. Im an newbie artist who is taking up art as a hobby, i normaly draw sketches on paper as im not to good with digital or colouring in general but for here i shall only upload fully completed works to the best i can, unless its okay to upload my pencil sketches. I normally draw vore stuff, i dont know why but i prefer to draw stuff like that than normal stuff but i do draw normal stuff just not as often. i wont upload any of my vore stuff here unless you guys are okay with it i dont tend to see much vore stuff here so im assuming its not a big thing here. I mainly draw MLP stuff (sorry if you dont like that type of stuff) but i have been trying my hand at other stuff such as pokemon and recently sonic, so hopefully i can get a good variety of content out there. Anyway guys i hope i make some nice friends here and dont become too much of nuisance. I hope you enjoy my stuff this is FoxKai signing off. I'll keep that in mind. 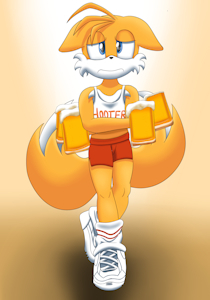 This "Hooters" thing has been going all over the place, it's fun. WEARING HOOTERZS for the win! this Hooters crase is great! I see. ^^; Well, I am a patient person. I won't force requests onto you. I can understand if the slots are filled, or if the requests are closed for a while.